Welcome to Issue #56 of the Bootleggers Buzz! A boring week with no major shootings and no amazing achievement feature. Fortunately Most Wanted showed their faces and shot several members of the statistics crew Decadence. A player named FPT, was able to kill several players. His reaction? Feel free to read that in the article regarding this event! So, that’s all what happened this week! As stated before, it was a boring week. To be very honest, we at the Buzz didn’t mind. At this moment we have a pretty small team and a few of our writers are inactive due real life circumstances. One of those writers is Sodium, who decided to leave the Buzz Team this week. A great writer, player and a great friend. We at the Buzz wish him all the best and we’d like to thank him for his dedication and all his hard work. We’ll miss you Sodium, thanks for everything! Alright, dry your tears, because we have some interesting articles this week! First of all we have an article of our first guest writer; 2Lazy2DoCrimes, also known as GPEnergy. Guest writers?! From now on the Buzz accepts guest writers. How to join? Well, it’s invite only, pity! The article of GPEnergy is about cheating. Is cheating a bad thing or is it the solution to the current inactivity at Bootleggers? What else do we have for you?! Well, we have another article about cheating, but this time about BOT’s. Do they exist and what is the best way to stop the use of those naughty thingies? An interesting read and we’d love to hear your opinion. And last but not least we have another amazing community picks for you! This time it’s about the several crews who are recruiting new players. It’s a long read, but it’s totally worth it! Alright folks, that’s it for this week. Not a lot events, but we got an amazing issue for you. Next week we have another amazing guest writer you will all know and we will cover all those big coming events. Enjoy the read and have a good Sunday! All manner of speculation surrounded the attempted wipe of Decadence from the Statistics this week. Last time it was Gangsters Sanctuary, were they back for more again? What potential effect is this cheating having on the game we love? Is it even happening? Or is it all part of theories that develop themselves so deeply in our minds that we become self-convinced the are true. A detailed look into current active recruitment processes, including a word with three Statistics based crews. Two players, plenty of questions, let's play Behind the Name! Another Forum Post of the Week for you to feast your eyes upon! Cheating, a very much debated topic these past weeks but hardly ever do people suggest cheats can be beneficial. Well, here is some food for thought in favor of 'cheating'. A not so concise look into the current state of affairs, involving all things crew, underground, lies, fronts and more! A list of all players who died this week. This week we witnessed some players getting killed by FPT, an underground shooter of Most Wanted. You thought those crews were allied? Well, not anymore! It's been a boring week, with no action. Therefore I have no idea what to write in the Weekly Flash. Uhm, Aetius has a new haircut! We already have two pictures in this Buzz regarding new writers, but we are really in need of them! 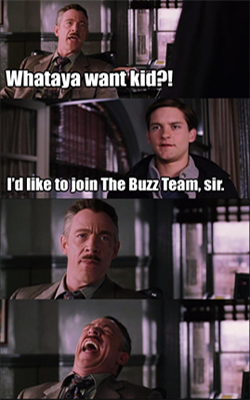 Don't be shy and apply for the Buzz, NOW! Do you hate his comics? Well, here's another one!